The program has attracted 52 people to the CSU gymnasium and their measured health improvement assessments are positive. 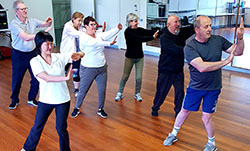 ALLong aims to help adults aged 50 years and over enjoy a long-term active lifestyle and extended years of independence. 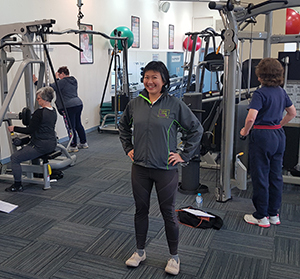 Dr Eevon Stott (pictured left), adjunct research fellow in the CSU School of Exercise Science, Sport and Health in Bathurst, said the ALLong program draws together research and education to empower the community to get healthier. “We have only been operating since last July, and the program has evolved to suit the needs of local population,” Dr Stott said. “The program gets great feedback from the participants, and the seven CSU work placement students assisting me manage the program. “The students have been instrumental in bringing the ALLong exercise program to another level. Dr Stott said the program is preparing for another phase of research data collection in the last week of February. “The research acts as a checkpoint for the participants to track their progress over time,” Dr Stott said. “When we share the results of the research with our participants, we sometimes feel we are the bearer of bad news. “But we know from experience that the participants’ second and subsequent results are likely going to show improvement, which acts as motivation to get even fitter. “2019 is going to be an exciting year, as we are in the midst of establishing partnerships with local businesses and non-government agencies, and we welcome new participants. Contact CSU Media to arrange interviews with Dr Eevon Stott.